Musial, J., Pecero, J. E., Lopez-Loces, M. C., Fraire-Huacuja, H. J., Bouvry, P., & Blazewicz, J. (2016). 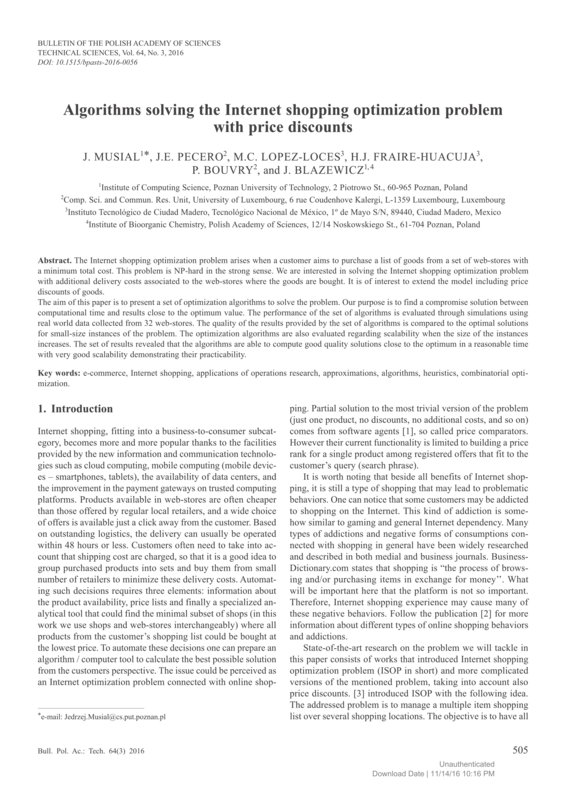 Algorithms solving the Internet shopping optimization problem with price discounts. Bulletin of the Polish Academy of Sciences Technical Sciences, 64(3), 505-516. Wagle, S.S., Guzek, M., Bouvry, P. (2016). 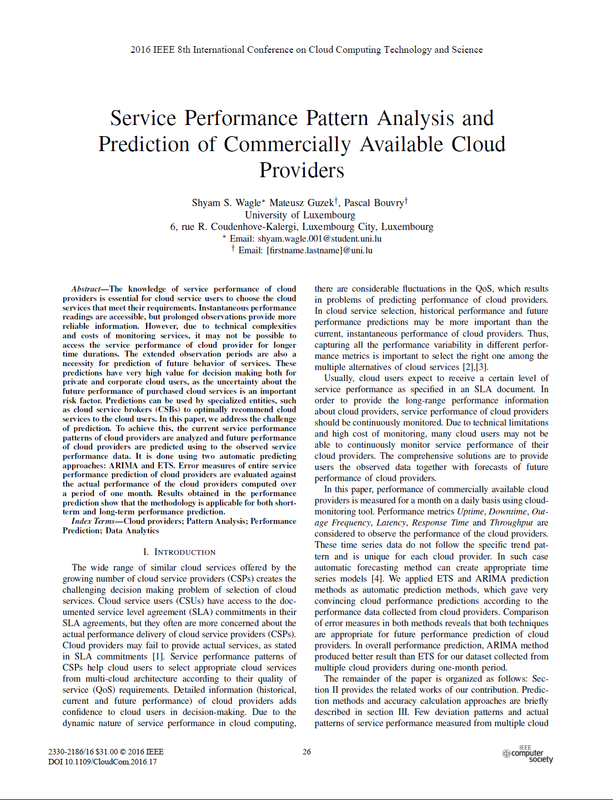 Service Performance Pattern Analysis and Prediction of Commercially Available Cloud Providers, IEEE International Conference on Cloud Computing Technology and Science (CloudCom), 26-34. Lopez-Loces, M. C., Musial, J., Pecero, J. E., Fraire-Huacuja, H. J., Blazewicz, J., & Bouvry, P. (2016). 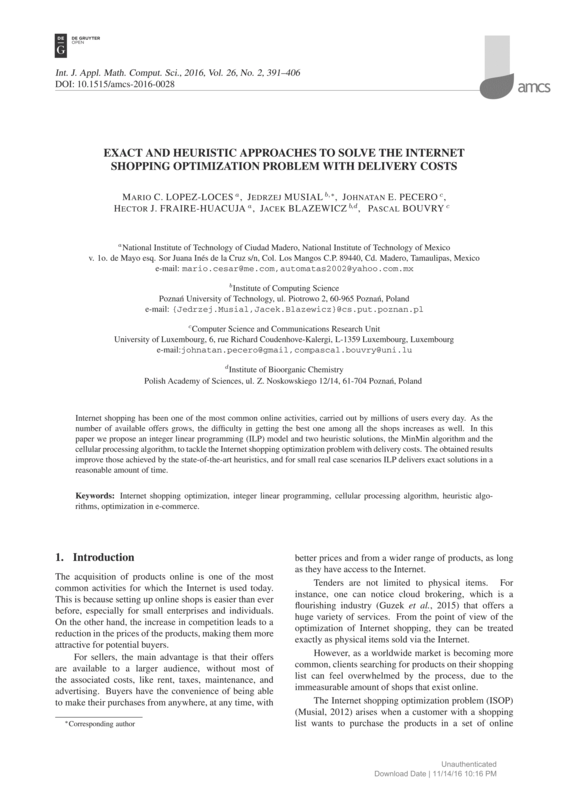 Exact and heuristic approaches to solve the Internet shopping optimization problem with delivery costs. International Journal of Applied Mathematics and Computer Science, 26(2), 391-406. 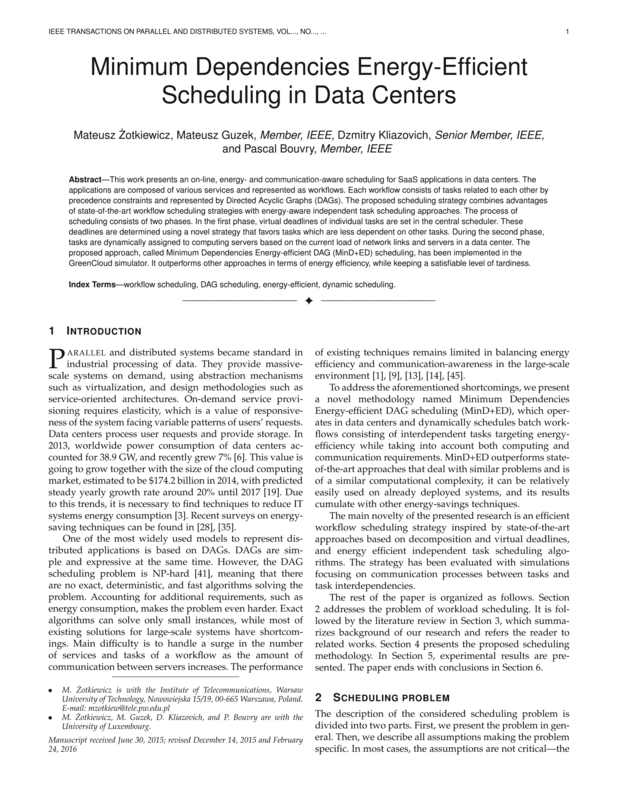 M. Żotkiewicz, M. Guzek, D. Kliazovich and P. Bouvry, Minimum Dependencies Energy-Efficient Scheduling in Data Centers, in IEEE Transactions on Parallel and Distributed Systems, vol. 27, no. 12, pp. 3561-3574, Dec. 1 2016. Ibrahim, A. A. Z. A., Bouvry, P., Kliazovich, D., & Oleksiak, A. (2016). 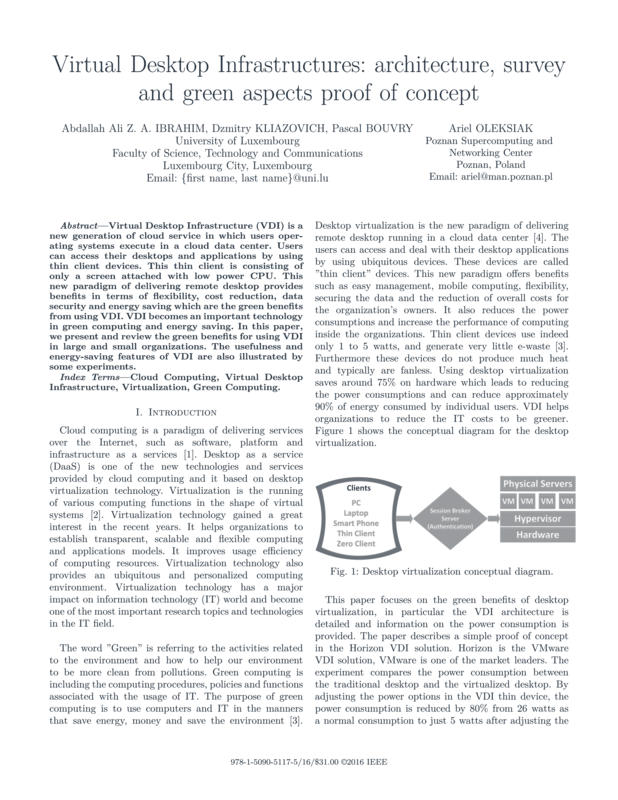 Virtual Desktop Infrastructures: architecture, survey and green aspects proof of concept. In International Green and Sustainable Computing Conference. Chen X., Sterna M., Han X., Błażewicz J. (2016). 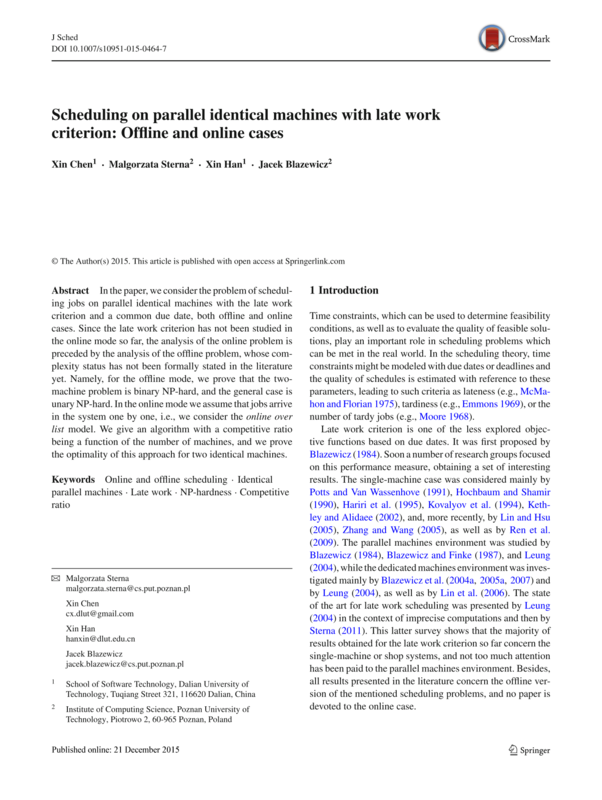 Scheduling on Parallel Identical Machines with Late Work Criterion. Offline and Online Cases, Journal of Scheduling 19(6), 729-736. Marszalkowski J.M., Drozdowski M., Marszalkowski J. (2016). 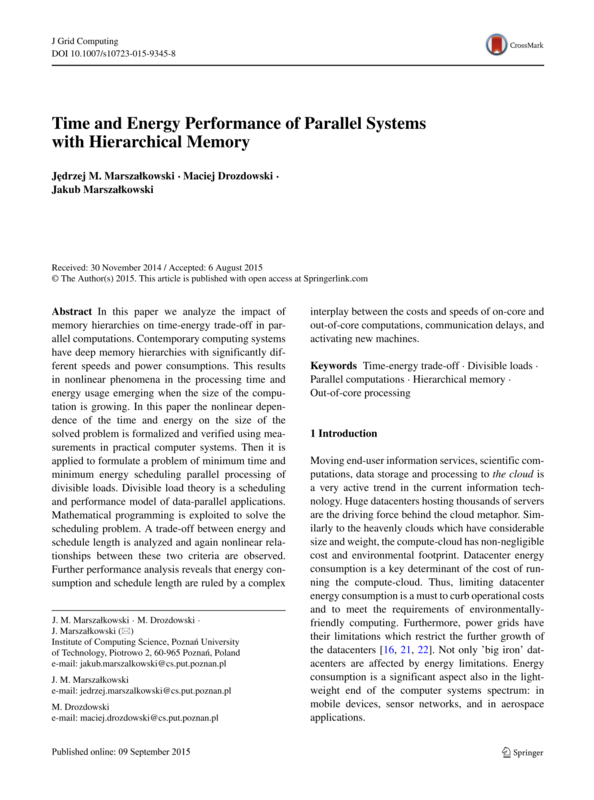 Time and Energy Performance of Parallel Systems with Hierarchical Memory, Journal of Grid Computing 14(1), 153-170. Blazewicz, J., Cheriere, N., Dutot, P. F., Musial, J., & Trystram, D. (2016). 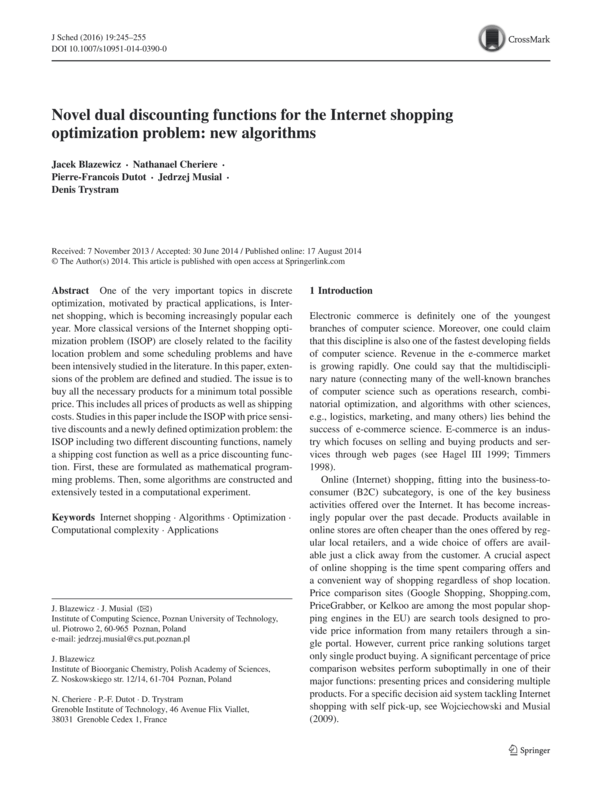 Novel dual discounting functions for the Internet shopping optimization problem: new algorithms. Journal of Scheduling, 19(3), 245-255. 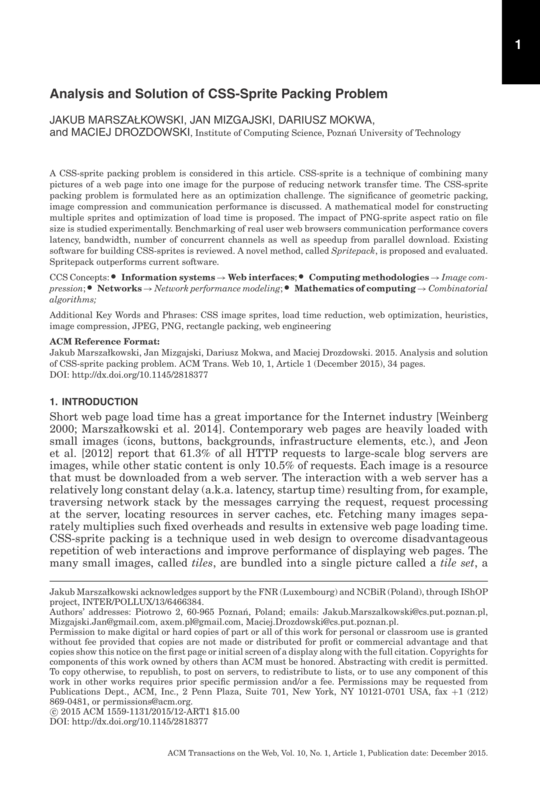 Wagle, S.S., Guzek, M., Bouvry, P. (2015). 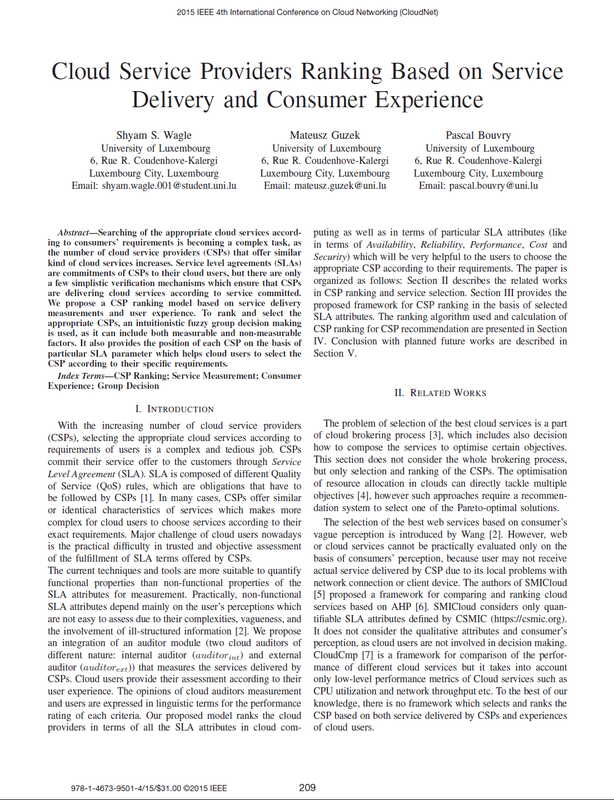 Cloud service providers ranking based on service delivery and consumer experience, IEEE 4th International Conference on Cloud Networking (CloudNet), 209-212. Wagle, S.S., Guzek, M., Bouvry, P., Bisdorff, R. (2015). 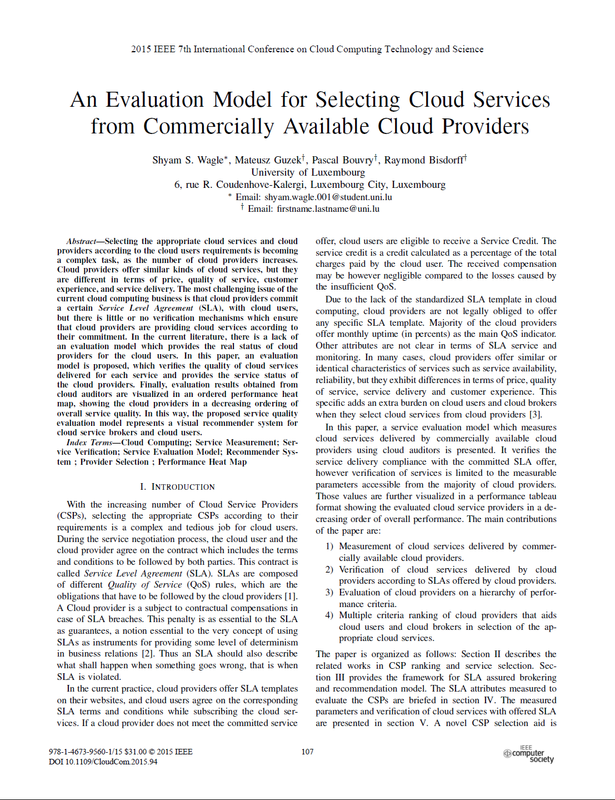 An Evaluation Model for Selecting Cloud Services from Commercially Available Cloud Providers, IEEE 7th International Conference on Cloud Computing Technology and Science (CloudCom), 107-114. Guzek, M., Gniewek, A., Bouvry, P., Musial, J., Blazewicz, J. (2015). 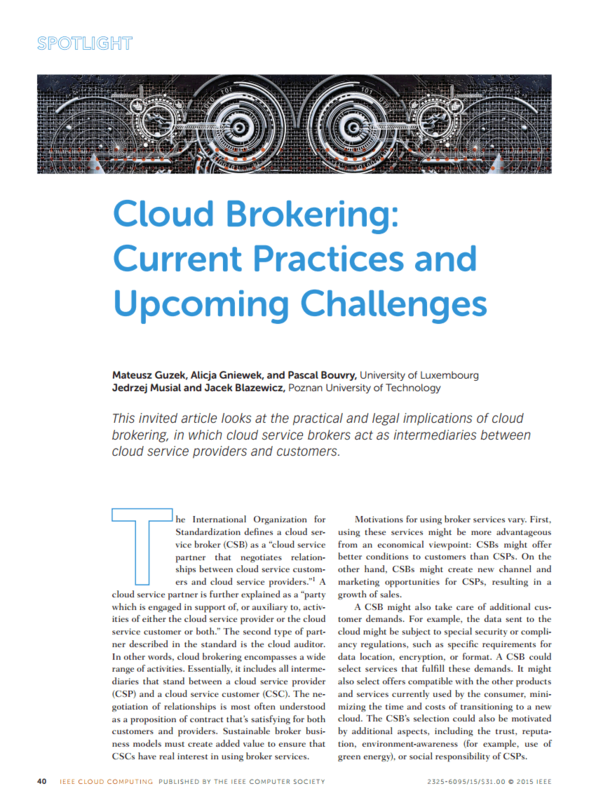 Cloud Brokering: Current Practices and Upcoming Challenges, IEEE Cloud Computing 2(2), 40-47. Guzek, M., Bouvry, P., Talbi, E.G. (2015). 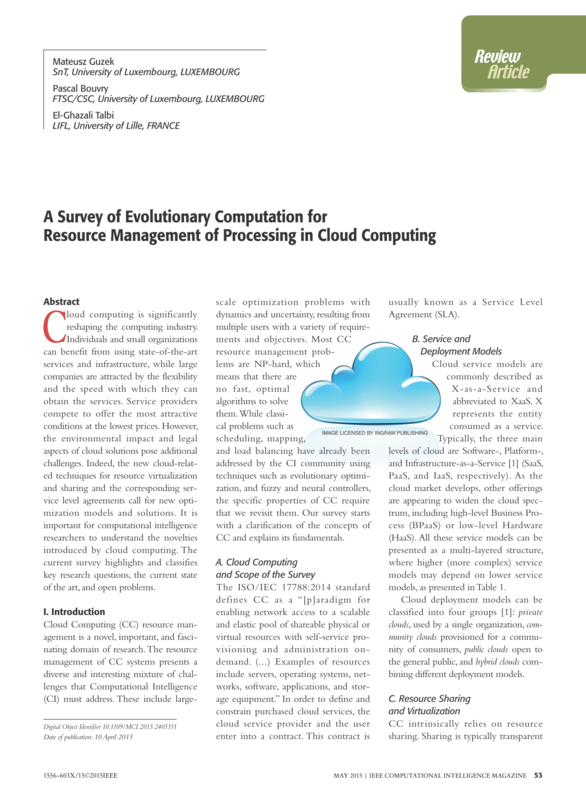 A Survey of Evolutionary Computation for Resource Management of Processing in Cloud Computing, IEEE Computational Intelligence Magazine 10(2), 53-67. Marszalkowski J., Mizgajski J., Mokwa D., Drozdowski M. (2015). Analysis and Solution of CSS-Sprite Packing Problem. ACM Transactions on the Web (TWEB), 10(1). Marszalkowski J. (2015). 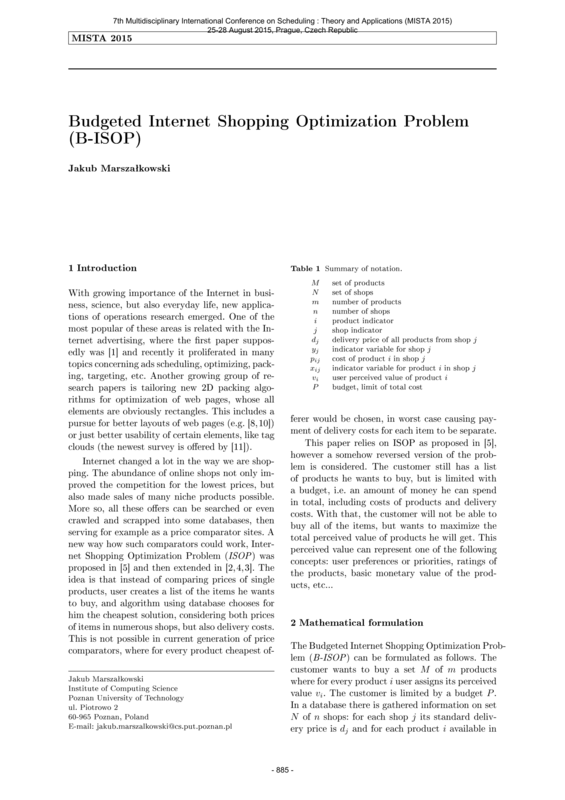 Budgeted Internet Shopping Optimization Problem (B-ISOP). Proceedings of Conference: 7th Multidisciplinary International Conference on Scheduling: Theory and Applications (MISTA 2015). pp. 885 - 887, ISSN 2305-249X. 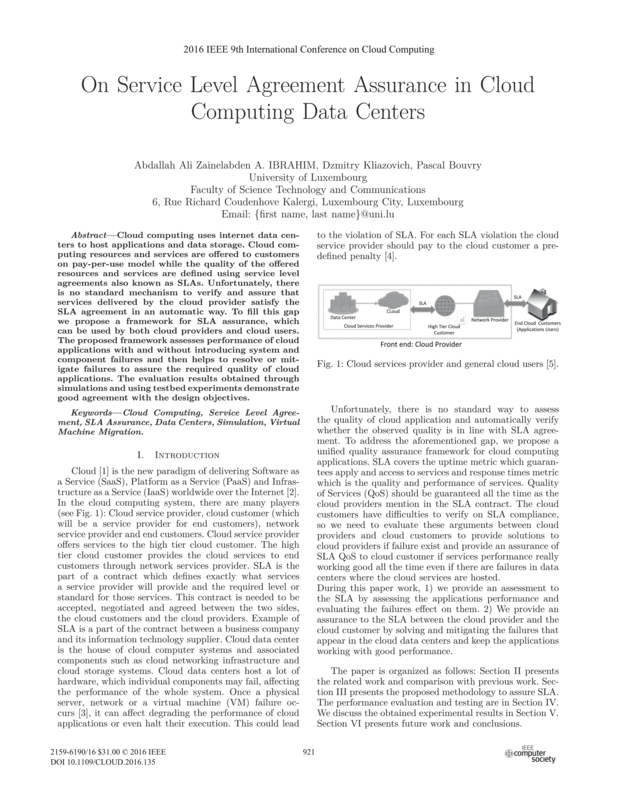 Guzek, M., Kliazovich, D., Bouvry, P. (2015). 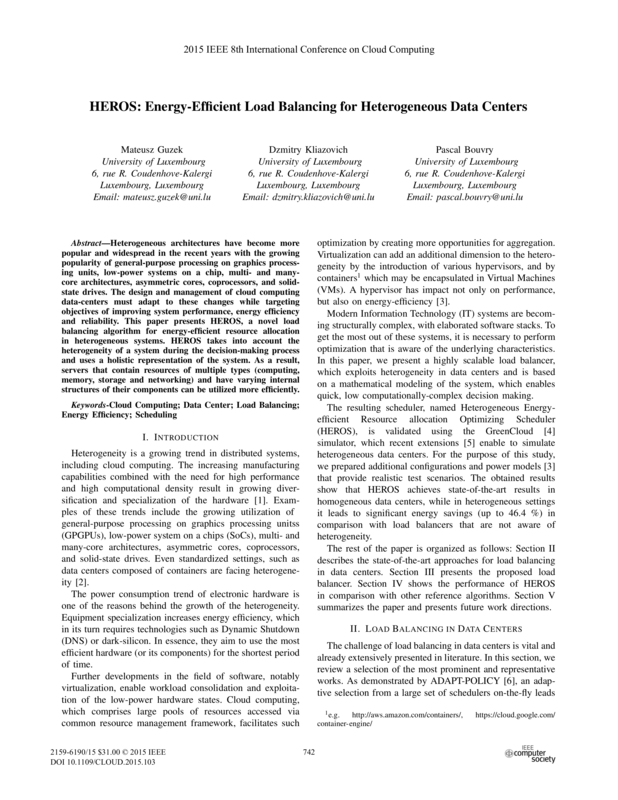 HEROS: Energy-Efficient Load Balancing for Heterogeneous Data Centers, 8th IEEE International Conference on Cloud Computing (CLOUD), 742 - 749. Nesmachnow, S., Iturriaga, S., Dorronsoro, B., Talbi, E. G., Bouvry, P. (2015). 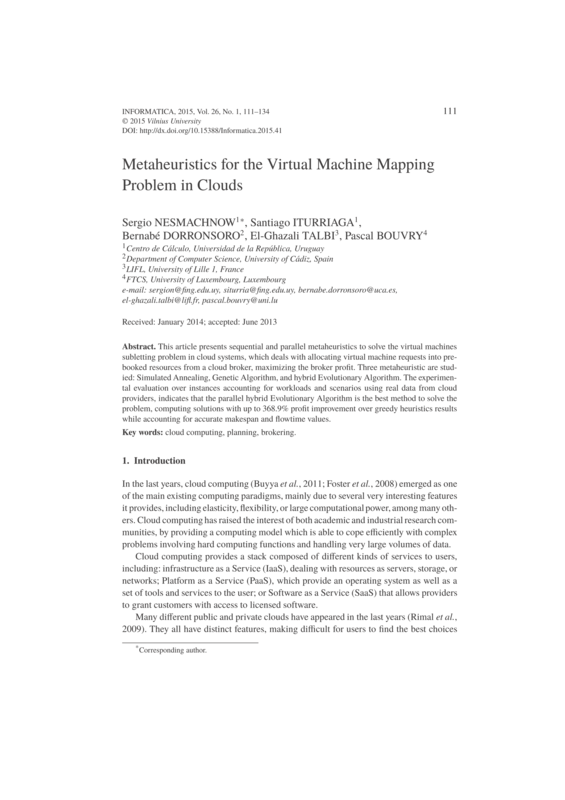 Metaheuristics for the Virtual Machine Mapping Problem in Cloud, INFORMATICA 26(1), 111-134. Nesmachnow, S., Iturriaga, S., Dorronsoro, B. (2015). 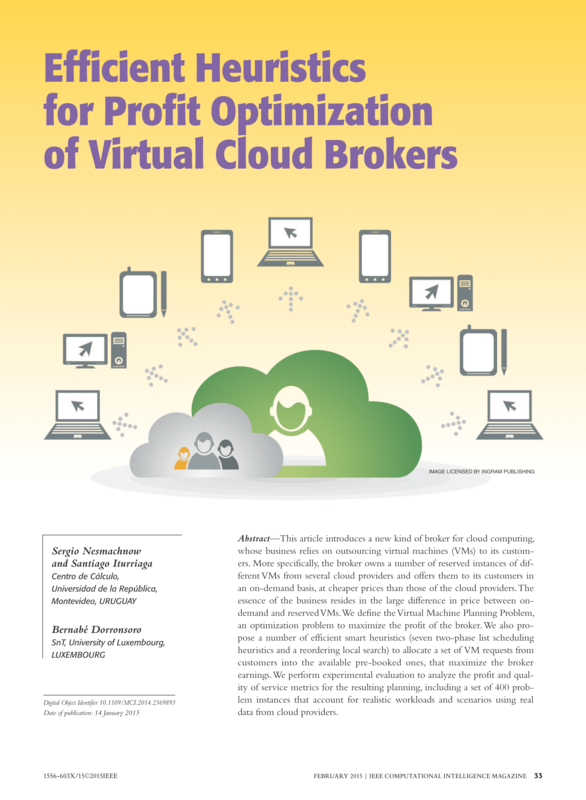 Efficient Heuristics for Profit Optimization of Virtual Cloud Brokers, IEEE Computational Intelligence Magazine 10(1), 33-43. Blazewicz, J., Bouvry P., Kovalyov M.Y., Musial J. (2014). Erratum to: Internet shopping with price-sensitive discounts, 4OR-A Quarterly Journal of Operations Research 12(4), 403-406. Musial, J., Pecero, J.E., Lopez, M.C., Fraire, H.J., Bouvry, P., Blazewicz, J. (2014). 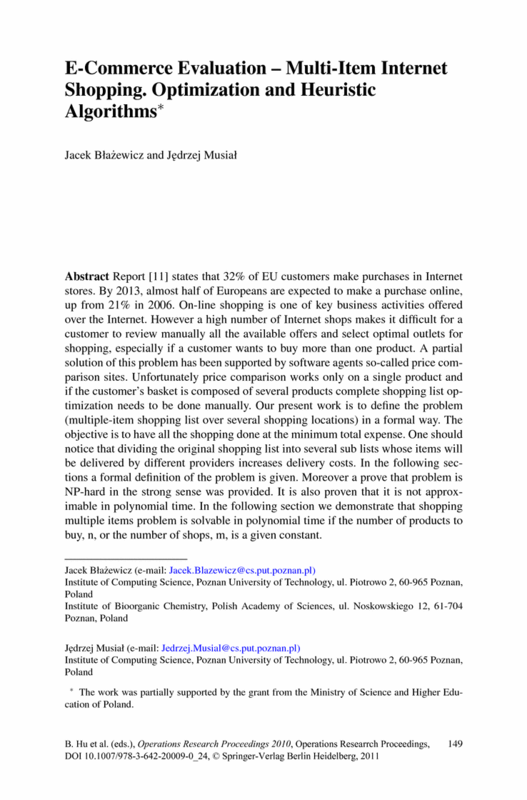 How to Efficiently Solve Internet Shopping Optimization Problem with Price Sensitive Discounts?, In Proceedings of the 11th International Conference on e-Business (ICE-B-2014), 209-215. Blazewicz, J., Bouvry P., Kovalyov, M.Y. and Musial, J. (2014). 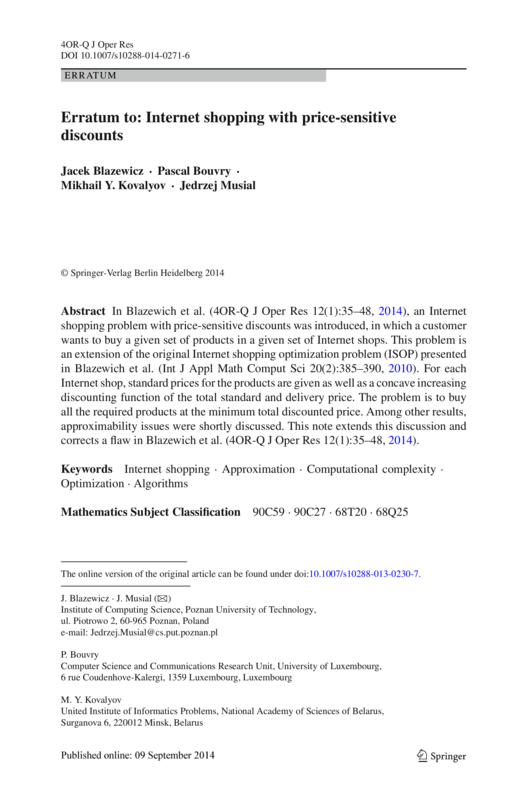 Internet shopping with price sensitive discounts, 4OR-A Quarterly Journal of Operations Research 12(1), 35–48. Blazewicz, J., Kovalyov, M., Musial, J., Urbanski, A. and Wojciechowski, A. (2010). 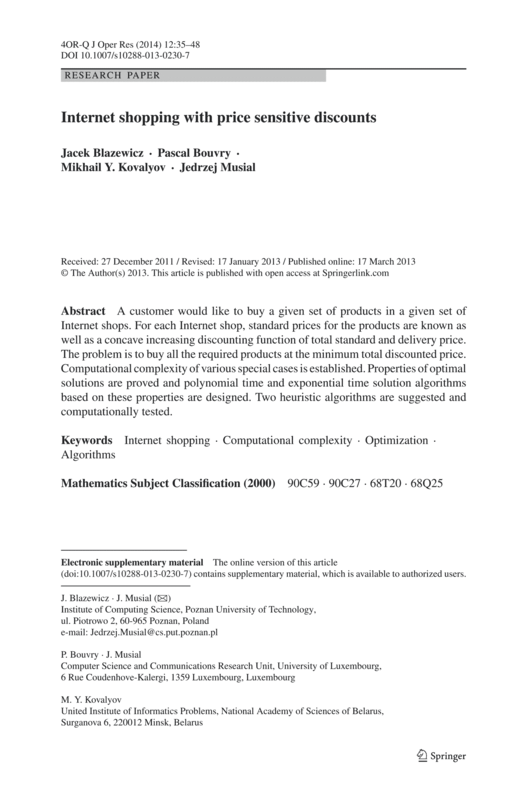 Internet shopping optimization problem, International Journal of Applied Mathematics and Computer Science 20(2), 385–390. Musial, J. (2012). 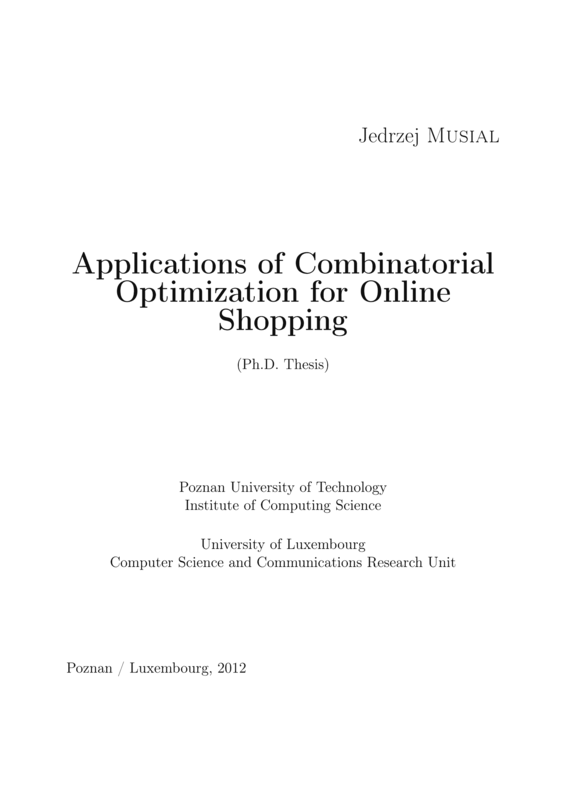 Applications of combinatorial optimization for online shopping. Poznan: NAKOM. Wojciechowski, A. and Musial, J. (2010). 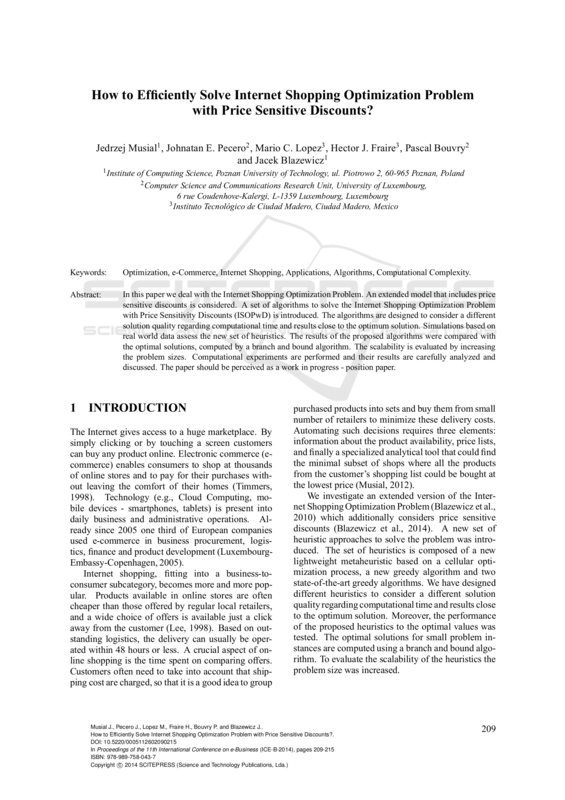 Towards optimal multi-item shopping basket management: Heuristic approach, in R. Meersman, T. Dillon and P. Herrero (Eds), On the Move to Meaningful Internet Systems: OTM 2010 Workshops, Vol. 6428 of Lecture Notes in Computer Science, Springer Berlin / Heidelberg, 349–357. Blazewicz, J. and Musial, J. (2011). E-Commerce Evaluation–Multi-Item Internet Shopping. 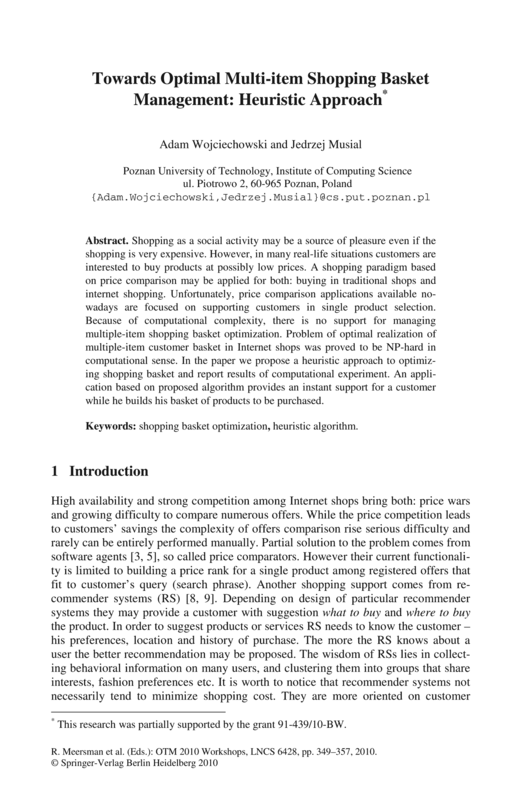 Optimization and Heuristic Algorithms, in B. Hu, K. Morasch, S. Pickl and M. Siegle (Eds), Operations Research Proceedings 2010: Selected Papers of the Annual International Conference of the German Operations Research Society, Springer Berlin Heidelberg, 149–154. Wojciechowski, A. and Musial, J. (2009). 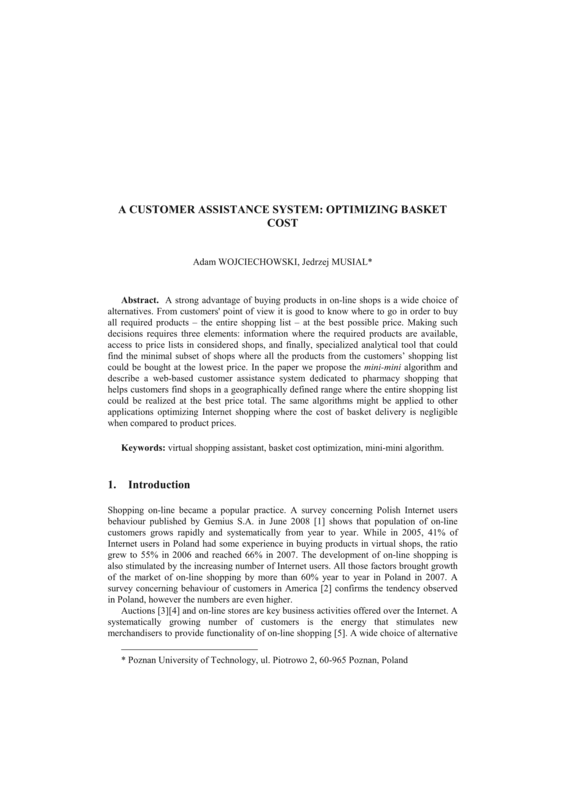 A customer assistance system: Optimizing basket cost, Foundations of Computing and Decision Sciences 34(1), 59–69.